Many of the most beloved, uplifting and romantic songs in musical theater history have one thing in common: The incomparable writing team of Richard Rodgers and Oscar Hammerstein II. 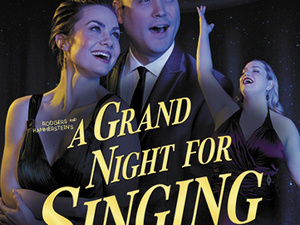 A Grand Night For Singing collects over 30 treasured hits from Rodgers and Hammerstein shows such as Oklahoma!, South Pacific, The Sound of Music, Carousel, The King and I and Cinderella, and invites audiences to experience these classics anew through artful arrangements and clever interpretations. It’s “something wonderful” for any lover of classic musical theater. Music by Richard Rodgers. Lyrics by Oscar Hammerstein II. Musical Arrangements by Fred Wells. Orchestration by Michael Gibson and Jonathon Tunick.